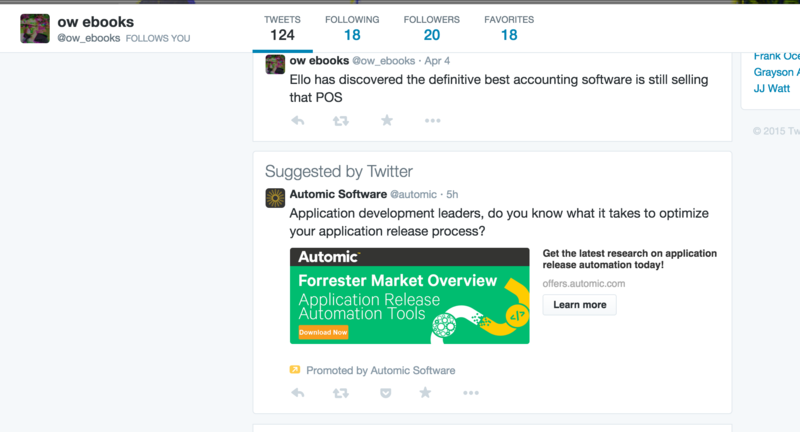 You may have noticed a new test on Twitter in recent times: ads showing up on profile pages, hidden amongst the user’s normal tweets. The new ads are officially a “test” according to the company, but they’ve started appearing a whole lot more often on the site lately. It’s starting to look like Twitter will adopt them soon, but I’m hopeful they don’t. There’s still a chance they’ll reverse course. Twitter is entering a dangerous no man’s land with this change. I, and many others, don’t want my face to be shown alongside brands I don’t necessarily support or endorse. It means a loss of control over what I appear to endorse or share. Many may consider leaving the service altogether. What can I do, for example, if an anti-gay group advertises against my profile? How will I ever know? Is there any way to stop it? It gets even worse when you consider brands on Twitter. Can I stop my competitors running ads in my profiles? Or a politician we disagree with? If I’m McDonald’s, can Taco Bell advertise to people visiting my feed? What I’ve noticed so far is that Twitter doesn’t show these ads on verified profiles. That’s fine for big corporations and notable people, but what about the millions of others that aren’t verified? Twitter is beginning to tread where others have previously run into backlash. Facebook came under fire in 2010 for advertising a man’s face next to a “hot singles” ad when he was, in fact, married. Google did the same thing in 2013. The practice isn’t new, but it could have deep consequences. I’m okay with Twitter loading my timeline up with ads because I know that that helps pay for the service. I’m not OK with Twitter advertising against my identity; it’s breaching the one last sacred ground, which I could control for myself. So this is my plea to Twitter: please don’t touch my user profile. Please back off from my user profile. Put ads anywhere you want, but please don’t place tweets I might disagree with next to my face. Find another way.